i just bought your book. your mom sent me the information on your book. she use to be my spanish teacher in high school. i’m looking forward to reading your book. i wish you much success. ireally want quincy and jack to have a baby or 2. maybe his brother can fall in love with quincy’s sis-in-law. just some thoughts for you to ponder on. i really felt like i was right there, like i was quincy. great book. Babies for Quinn and Jack? Hmm… perhaps in the future! Thanks again, Sheri! I just finished your book and wanted to tell you how much I LOVED it! I read every day and this book is by far the best I’ve read this year. I wanted to start from the beginning and read it again as soon as I finished. Please tell me there is a sequel in the making? I have let all my friends know that this book is a must read. Keep up the good work! Thank you so very much! I’m so glad you enjoyed it; your kind words have made my week! Yes, there’s a sequel in the works. It’s just coming slowly, because I have a 3 1/2 year-old now (I didn’t when I wrote Keowee Valley) and a baby due May 1st. But it’s coming! Thank you, too, for passing the word. I really appreciate it! when can we expect the continuation? Hopefully within the next couple of years! I’m working on a Civil War-era novel right now, based on the descendants of Quinn and Jack. I’d started it before I knew Keowee Valley would be published. Also: I’m finishing up a graduate program, teaching part-time and am mama to a 4 year-old and a 10 month-old, so I’ve got my hands full! Thanks so much for writing, and for wanting a continuation of Quinn’s story. It’s coming! I just finished Keowee Valley. It was an immersive read for me, and I find myself mourning that it is over! I really cared about the characters. They were often in my thoughts throughout my day. I would love a sequel about what a Cherokee thought of Italy and their children. Thanks so much for a great book. I can’t tell you how glad I am to hear it! This is exactly what an author wants to hear a reader say about her novel–I, too, feel the same way about my favorite books. I hope you’ll be patient with me as I work on the sequel (it’s taking a bit longer than I’d like with a 4 year-old and a baby at home). I just finished this book. I loved it. It shouldn’t have ended. I want more. Please write another, a sequel. I’m left hanging. It was a wonderful adventure. Thank you for your wonderful writing. Thank you so much, Cynthia. You made my night after a very long day! I’m slowly but surely working on a sequel, so I hope you’ll hang in there. I have two children under the age of 5 now, and I didn’t have any when I wrote Keowee Valley, plus I’m a college teacher and in graduate school, so life sure is different! If you’re interested, you can find other writing of mine (but no other novels yet) under the “Extras” tab. 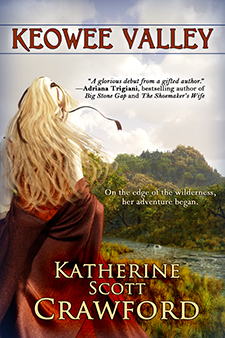 And have you checked out Genevieve Graham’s historical novels? They’re wonderful, and also set in 1700s South Carolina. Just finished reading “Keowee Valley” and loved it. And, as everyone else has said, waiting for the sequel. Thank you for,this work! Thanks so much for reading the novel, David! I’m so happy to hear you enjoyed it. Much, much too slowly. Thanks for asking, though!